A complete copper alloy strap clasp or buckle frame dating to the medieval period. The main clasp frame is rectangular in plan with a cast knop in the form of a crowned head on the outer bar. The features including detail in the crown, the eyes nose and mouth has been enhanced by engraving. The shoulders widen below the 'neck' before turning into the main frame and decreasing in size. 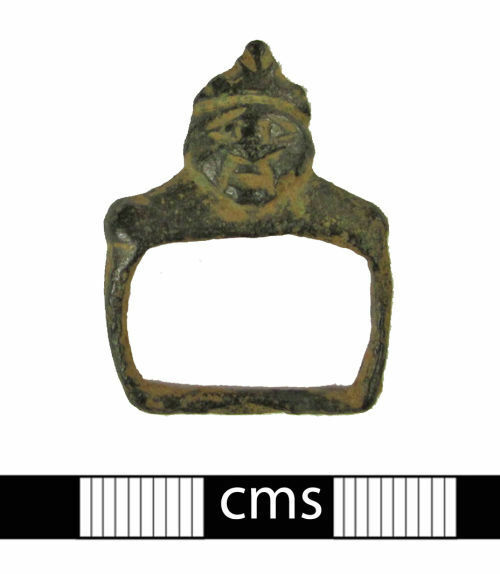 Gilmore's Head and Shoulders type, dating to the 14th century AD (see http://finds.org.uk/blogs/westmidlands/2011/01/06/kings-head-strap-clasps-or-buckles/).